A camera and other equipment Libby used are now kept at the MAC. Charles A. Libby hauled his camera down the steep stairs on the north side of the river and stood on a wooden platform at the base of the lower falls. The young man turned his lens south toward the steel lattice of the Monroe Street Bridge and the silhouette of the downtown skyline, but his eye was on the water. What did Libby see in the falls? Did he see the graceful dancing of the spray, the sun off the water, the water tossed into droplets of light before crashing on the wet, black rocks below? Did he see it in black and white, as it would emerge later from the darkroom chemicals? Was he thinking of people who might want to purchase such an image, or was he just thinking of shadow and light? He took a frame, and another. He took a whole series, each one a slightly different moment isolated from the roar of the ever-crashing falls. Imagine Spokane as it was a century ago: A bustling city rebuilt after the devastating 1889 fire, flush with insurance money and mining fortunes, the downtown streets busy with streetcars and automobiles beneath a tangle of wires. If you can picture those streets, or elegant social gatherings at the Davenport Hotel, or the Grand Coulee Dam under construction, you most likely have seen Libby’s work. Our memories are made of Libby’s photographs. 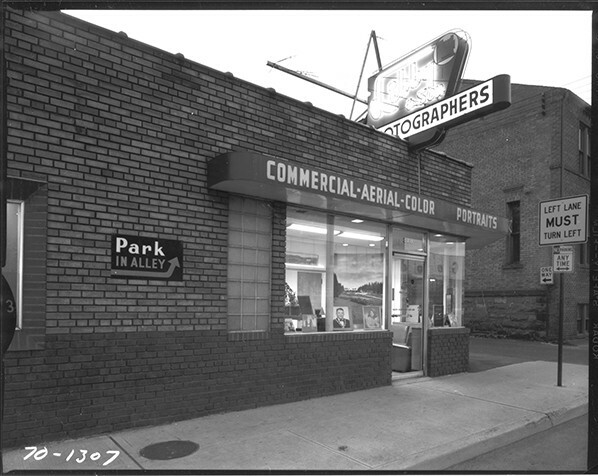 Many other photographers made their homes in Spokane in the early days and the decades that followed, but no other photographer took so many photos over so many years. By the time he retired in 1962, Libby had witnessed and recorded more than six decades of construction sites, businesses, social gatherings and special occasions. He photographed four Presidents and every landmark of the region, and left more than 200,000 negatives. Local historians have described his photographs and meticulous ledger books as a “monumental collection” and an “invaluable historical resource.” Libby left a vast and valuable record of Spokane’s growth — but very little of himself. Libby arrived in Spokane in 1898 at age 19. His family — mother, older brother and two sisters — moved from Olympia after the death of his father, a mining engineer who had come out to the West Coast from Maine. Unlike Olympia, Spokane was booming. The population had doubled in the 10 years since the fire. Libby helped his older sister, Addie, in the photography studio she opened in downtown Spokane. By 1902 the pair split off to operate their own studios. The reason isn’t clear — it may have been a business choice, or more likely a difference of vision. Photography was not uncommon at that time — Spokane had eight photographers listed in the 1900 city directory — but most photographers stayed in the studio and specialized in portraits. Most who traveled specialized in landscapes and stereoscopes. The equipment was bulky and heavy; controlling the light was essential. Libby took portraits throughout his career, but made a name for his studio by taking his camera out of it. His sister’s advertisement in 1903 said: “Visit the Libby Art Studio for Artistic Photographs.” Libby called himself a “commercial fotografer,” and he would come to you. He married Gretchen Schlussler in 1905. Their only child, Charles A. Libby Jr., was born two years later. On Sundays the Libbys would pack a picnic and take a ride on the streetcar, and if a building under construction or grand new home caught Libby’s eye, he would stop to photograph it, just in case someone might want a print. Libby was a hustler. He must have been tireless. Decades later, his son recalled reluctantly working weekends as a boy out at Liberty Lake and Coeur d’Alene, where companies and clubs would hold huge picnics. The Libbys would take a group photo, drive back to the studio in Spokane to develop a proof, then rush back to the gathering hoping to catch everyone before they left. The proofs would be passed around, and anyone who wanted a copy would write a name and address on the back. In those days the Libbys used Kodak’s Cirkut panoramic camera, and they’d get the whole party to pause from their picnic and line up in long rows for a photo. Every group had a joker, the younger Libby later recalled, who would stand at one end as the camera started and then run around back so he’d show up on both ends of the photo. Many times a photo was ruined with blurry faces as everyone else turned to look at what was going on behind them. Libby was an innovator; both he and his son were fascinated by technology and machines. It was a time when, if a family bought a new car or a company bought a new fleet, the Libbys would get a call to come photograph the proud occasion. The Libbys showed up for the wrecks, too — they took thousands of photos of derailed trains and crashed cars for insurance companies. 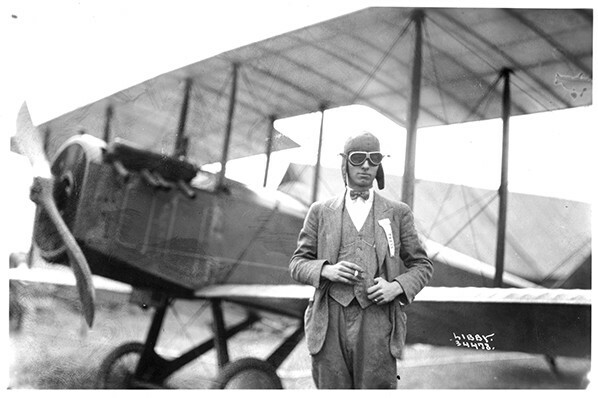 Around the same time the Libbys photographed the National Air Races at Felts Field in 1927, the younger Libby took photography to the sky with some of the region’s first aerial shots. He would go up with pilots he knew at Felts Field and step out onto the wing with an arm wrapped around a strut and both hands on the camera. A local company made a special harness that tied him to the plane in case he lost his balance. Beginning in 1933, the Libbys were hired to photograph the full construction of the Grand Coulee Dam. From the excavation to many years afterward, the Libbys took their equipment to the site and the surrounding hills to photograph the piles of earth and gravel, the concrete and steel, the heavy trucks and cranes reshaping the landscape. 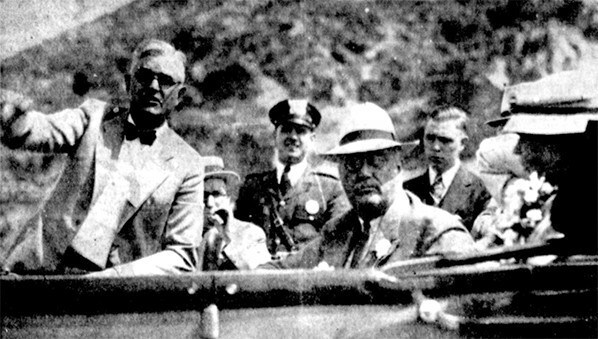 In 1934, President Franklin Delano Roosevelt came to visit the dam, and was driven to a promontory on the east side of the Columbia River to view the site before addressing the crowd. Unlike the Associated Press photographers swarming for the president’s visit, the younger Libby knew his way around and waited patiently beside a rock. As the car rolled by, he snapped an up-close photograph of FDR’s face — shadowed by the wide brim of his hat — that became one of his most widely seen. His fondest words, though, were for the days spent in the sun at the Grand Coulee Dam site. Charles Libby Sr. died in 1966 at age 86, four years after he retired. In 1969 his son sold the business to Keith Henry, who had previously worked for the company, and it was Henry who recognized the value and immensity of the studio’s collection. It wasn’t a collection he could maintain himself, and he made arrangements with the Eastern Washington State Historical Society to sell a portion of the negatives and donate the rest in 1987. 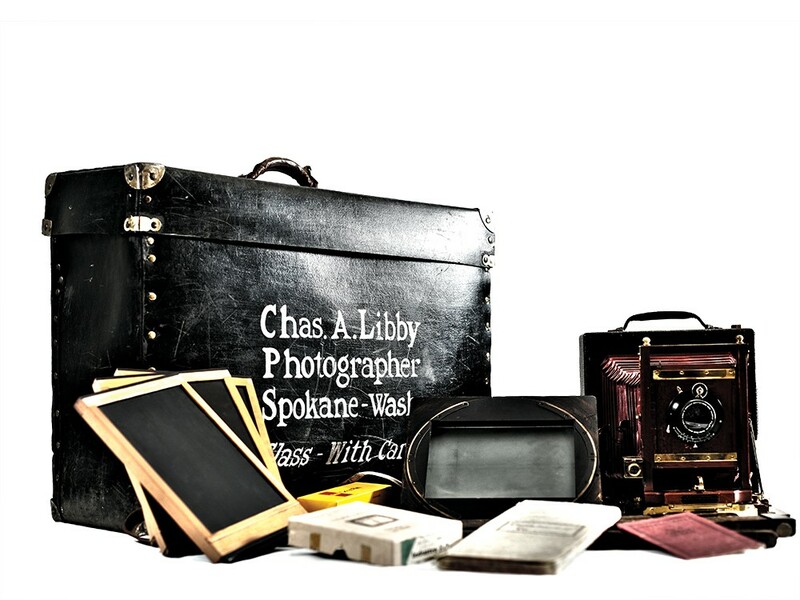 By the time a portion of the collection was preserved and discussed in 1979, it was necessary for historians to point out that the Libby photographs do not show a complete record of Spokane’s past. Libby and his son took very few photos of Spokane’s black and Asian communities; they did not photograph crime or poverty. While photographers working for the Farm Security Administration captured migrant families and Dust Bowl landscapes during the Great Depression, Libby photographed ladies in furs crowded around the window displays at Sears, Roebuck and Company. While war photographers wired home images of fallen G.I.s in World War II, Libby photographed department stores and soda fountains. While early documentary photographers captured the tenement slums and child workers at the turn of the century, Libby photographed the falls. “They didn’t go out and take pictures of slums unless someone hired them to take pictures of slums, and no one did,” the Washington State Historical Society’s curator of special collections, Edward Nolan, said at the time of an exhibit in 1991. There’s a modern impulse to apologize, to justify — to clear Libby of culpability by vacating his intent. It was all a matter of business: He aimed his lens in the direction that money asked him to. What happened to the young man who stood beside the crashing falls, watching the spray and the light? Maybe that was idle practice; maybe he no longer had time, with a family to care for and a business to run. He stopped riding the streetcar looking for grand houses; he bought a car and rushed to keep up with requests. Through his decades of ledgers, we know who Libby worked for on which days, when he had his cameras cleaned and what price he paid for his darkroom chemicals. The photos of Libby himself show a man at ease, with a broad smile and dark-rimmed glasses. Even in portraits he carries a look of eager momentum, like he is used to being on the move. 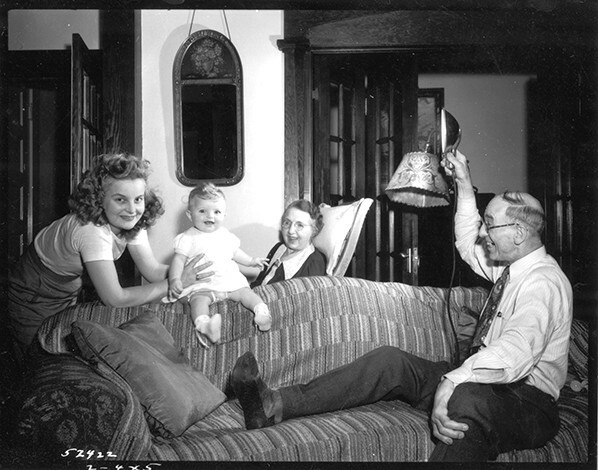 As a young man he jokes around in the studio; as a grandfather, he sits to the side of a sofa and makes faces at the baby to get her to smile. His work was driven by money, surely, but Libby was not merely a businessman or a technician. He was not an impassive recorder of his clients’ wishes. It’s clear in the casual pride of men standing beside trucks with their hands in pockets and hat brims obscuring their eyes; in the light falling through the trees onto children dressed in white at Natatorium Park; in the symmetry of pyramids of canned goods and polished floors, the repetition of shining factory assembly lines, the dark curve of rails bending to meet the horizon — he was biased toward beauty in lines and light, and presented his subjects the way they imagined themselves. Libby was an optimist. He sold the idea that special occasions require evidence, and he predicted our nostalgia. Over the years, Libby appears in some of his own photos as a shadow in the lower corner of the frame. It’s not clear whether this was simply accidental, unavoidable given the position of the sun, or if it was something more intentional. Did he want us to take notice? Was he deliberately leaving evidence of himself? A newspaper article printed in 1949 when the company opened a new state-of-the-art studio on Lincoln Street between Second and Third described Libby as a “clear-eyed, robust-looking man.” He was 70 years old, and he’d been photographing Spokane for more than half a century. He and his son had decided to build after their longtime studio in the Exchange Building was torn down. “The wrecking crews have had to chase me out of most of the offices I ever had,” Libby said. None of the buildings where he worked still stand. Not the first one, on the second floor of a narrow building on Post Street, nor the second, in the old Granite Building that stood where the Paulsen Building is now. The studio on Lincoln that was new in 1949 was torn down less than three decades later. Libby admired progress, and he also understood the inevitability of loss. It’s not clear what Libby wanted us to see in the shadows of himself, but they look now like blind spots, negative space — reminders of how much we might never have seen if Libby had not taken the photo. Research for this story comes from contemporary newspaper accounts, materials from the Northwest Room at the Spokane Public Library and, most of all, the Libby Studio Photograph Collection and other resources at the Joel E. Ferris Research Library and Archives at the Northwest Museum of Arts and Culture. Curator of Special Collections Rose Krause and archives assistant Jane Davey generously shared their knowledge and time. Details are drawn from interviews by John Ross of Eastern Washington University, James B. Hunt of Whitworth University and the research of former MAC curator of history Larry Schoonover.